Anything from a hike down to the river, playing a game of croquet on the expansive lawn, swimming laps in the pool or putting on a delicious barbecue in the Pool House with a view- the Lodge has it all. Take a walk to the river, play croquet on the large lawn, swim in the pool, or put on a fabulous barbecue with a view; all these and more are why people come year after year to enjoy all that Klamath River Lodge has to offer. 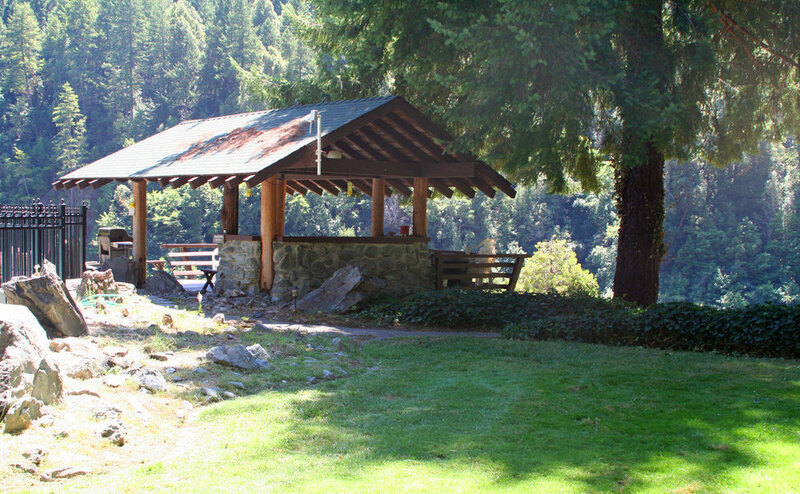 The Pool House is a unique covered picnic area with a deck that overlooks the fields and rushing Klamath River below. The Pool House is a perfect spot to create and share an unforgettable barbecue! The view off the Pool House porch is undoubtedly unique. If you are lucky you may spot a bear across the river fishing for his own dinner or see a Bald Eagle soaring overhead. The expansive lawn area is the perfect place to enjoy a game of catch, croquet, flag football, tag and more. Your imagination is the only limit on what fun a group can have in the great outdoors! A stroll down the Barn Trail, may bring to life Robert Frost's poem, The Road Not Taken, as leaves crunch underfoot and your heart is your only guide. No matter what the season no one can turn down a walk down to the Klamath River. The sound of the rushing water combined with the chirping birds allows you to appreciate all the beauty nature has to offer. The orchard is a quaint place to meander and take in the surrounding scenery. Bring a good book and let the peaceful sound of silence resonate. The pool is a refreshing place to relax. There are lounging chairs to allow you to soak up the sun, take a summers nap, or read a book. The pool is nestled in with views of the Orleans Mountains to one side and the Lodge to the other. A calm summers breeze wanders through every so often, cooling the sunbathers as it goes on by. Wide open spaces leaves a world of possibilities open to the imagination. Run free like the sound of music, bring a football and play a game or have a picnic lunch with the sounds of the rushing Klamath River as the soundtrack. The Klamath River is a highlight to every trip. Listen to it rush and trickle over the rocky river-bed and try your hand at skipping rocks. It is hard to imagine a more beautiful place than the wild and scenic Klamath River.